Join in the celebration of Cinco de Mayo with a bilingual Mass and fiesta following! There will be an awesome buffet of Mexican food (free will donation), fellowship, a pinata and a kids corner with fun activities. Ole! Join us in the fun of celebrating Mother’s Day Dinner on Monday, May 6 with a Cinco de Mayo themed taco/Mexican bar! New this year - our vendors will be open and ready to sell you their awesome products at 5:00 pm. Dinner begins at 6:00 pm. Also, Angel Ramos will entertain us with his guitar playing and singing! Purchase your $15 ticket after Mass on April 27/28 and (if any are left), May 4/5 or you can come in the office and buy your ticket. VBS 2019 - POWER UP! This year’s Vacation Bible School is a video-based program. Mark your calendars and plan on joining in the fun. Volunteers are needed - adults, high school and middle school students. If you are interested, please contact Tami Maurer at tmaurer@saintjoan.org. Hey ladies, come join us for our next book group starting Thursday, April 25 at 6 pm. We will be reading "God's Hotel" by Dr. Victoria Sweet. Contact Jan to reserve YOUR book! 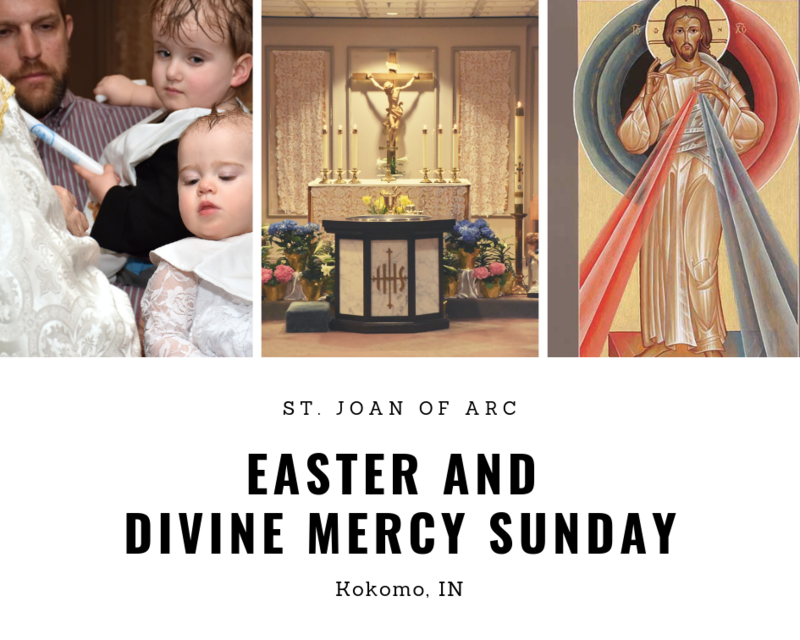 Join us for Divine Mercy Sunday, April 28. At 2 pm we will begin with Adoration and confessions and at 3 pm we will sing the Divine Mercy Chaplet to conclude the 9 day novena that we begin on Good Friday. Moms’ Ministry is hosting an Easter Egg Hunt on Sunday, April 28 at 12:30. Please meet on the west side of the building. If you would like to donate some non-chocolate candy please drop off in the baskets in the kiosk. Thank you!